Because who doesn't like something that smells SO good! There are 10 different scents, so you're sure to find the perfect one! These little bracelets are so cute! They make the perfect gift! I can only imagine how good these smell! They create bubbles and also have oils to moisturize skin! I really want one of these monogram necklaces for myself! Ha! A personalized gift like this is always a winner! How adorable are these coffee mugs!? Such a cute and useful gift for mom! This is another one I'd like for myself, haha! These UGG slippers come in so many colors, and look so comfy! I love stuff like this! It would be such a useful gift! I really like the silver and gold together in this watch! Its a timeless piece she could have for many years! This seriously looks so cozy! This necklace is gorgeous! This is another piece that she will have for many years to come. It is beautiful! Who doesn't love Fixer Upper?! This would be an interesting read! I love these Kendra earrings! They also come in SO many colors! Put a picture of you and your mom in this, and it will instantly become something she will always cherish! These candle jars are so cool looking! They come in a few other colors, too! How cute/funny is this pillow! Love it! How adorable is this recipe book!? If your mom is a cook, this would definitely come in handy and keep all her recipes organized! Another cute gift for the cook! 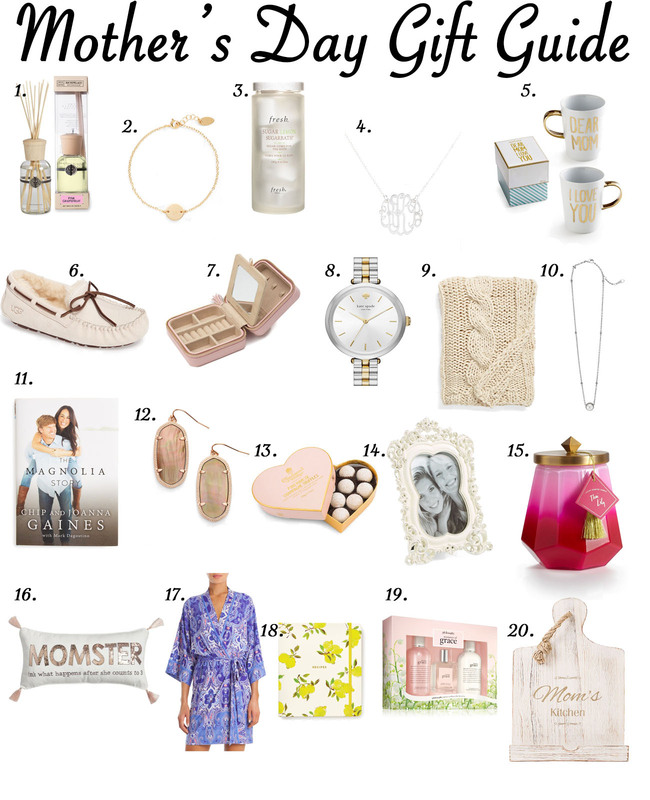 If you still haven't got your mom anything for Mother's Day, don't worry! You're sure to find something here!